Electric radiators are an excellent solution for heating. Whether your electricity is generated using fossil fuels or sustainable resources, they work just as well. 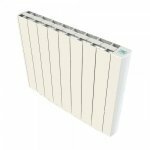 Our range provides an economical and effective electric heating system. They offer quality, reliability, and easy installations with realistic running costs. Available as free standing or wall mounted, traditional to electric designer models, our range of luxury low cost stylish electric heaters offer an unrivaled level of quality and comfort for your home heating. Heater Shop offers a wide range of energy efficient electric radiators from well-known brands to heat your home. Our range of products include Rointe, Dimplex and Haverland. Our models will suit households with all types of rooms and budgets. Our heating solutions range from dry ceramic and aluminium core electric heaters to gel or oil filled. Many of the products offer features such as timers and thermostats. If you need help choosing a size then use our heating calculator or call us on 01473 276686 and one of our technical team will be happy to help you. Electric currently costs more than gas. However, as you can control electric more precisely with the use of thermostats and timers, in the long run, electric can work out to be the cheaper option over gas central heating. Evolving technology such as smart heating will make this type of heating even more efficient to run as the technology will start to understand your house needs and react instantly to ensure even less heat wastage to give you peace of mind. All our products show you what size room it heats up to in m2. If you are still unsure, you can you our room calculator which will provide you with all the details you need based on the size of your room, which area of the country you live in and which direction your property faces. Simply enter a few details based on the above and the calculator will provide you with a wattage enabling you to choose your items based on the wattage needed for a room. All our radiators are suitable for DIY installation as they come fitted with a 13amp plug along with fixtures and fittings. We also provide a fitting template which will show you exactly where to drill holes and place the screws. If you’d prefer a more professional installation, a qualified electrician will be able to do so quickly and easily. This depends on the size, purpose and usage of the room in which it is being installed in. A dry radiator will heat up quickly and efficiently, ensuring no heat energy is wasted when you do not need it. An oil-filled radiator will take a bit longer to heat your room but will heat your room for longer. Oil-filled is seen to be safer than dry, as air flow to dry radiators can be affected by dust - therefore they can overheat and can be hot to the touch for children and animals. Low surface temperature dry electric radiators are available and although not widely available, they’re a great option for those who prefer the dry over oil filled. A gel-filled radiator is quite like an oil filled radiator although it uses a thermodynamic gel rather than oil for greater efficiency. If you aren’t sure which product would be suitable for your household or commercial property, our expert team will be happy to provide you with more information and offer guidance to ensure you get the most effective and efficient heating for your needs. Call us now on 01473 276686. Do they come with fixing brackets? Most of our products comes with a fixing kit, which includes the brackets, plugs and screws. The majority of our products also come with an installation guide as well as a fixing template which allows you to measure exactly where screws and fixings need to be placed. The application process is very simple however we do advise you have the product installed by an authorized professional installer if you are not comfortable with installing the product yourself. Choosing the correct size radiator is crucial to the overall comfort and efficiency of your heating solution. Each of our product descriptions displays a measurement in m2 which represent the model’s recommended room floor area it can provide for. To find out the size and wattage you require, first measure the space you intend to warm. You can do this be multiplying the length in meters with the width. Once you have this number you can enter it into our room calculator. The program will also ask you for some more information about your room including your location, orientation and insulation. The room calculator will allocate you an appropriate minimal wattage which you can measure against the products in our collection, giving you a selection of products which are suitable for your needs. Thank you very much for the brilliant feedback and we look forward to hearing from you again. Thank you for the great comments and 5 star review, it is very much appreciated. Thank you for the really great feedback and recommendation to others, it is very much apprecaited. This is really fantastic to hear, thank you for leaving such brilliant feedback.